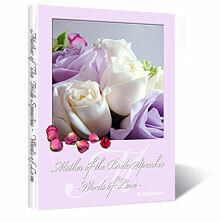 You are about to place an order for "Mother of the Bride Wedding Speeches", which contains 20 professionally written sample speeches and step-by-step powerful tips and techniques for writing a memorable Mother of the Bride wedding speech that is guaranteed to make your daughter proud! $17 FREE Bridal Showers to Remember! $27 FREE The Bachelorette Party! $37 FREE Email consultation with me to iron out any issues that you may have with your speech! 3. Press 'SUBMIT SECURE ORDER' and you will be directed to the Clickbank Order Form. From there you will be redirected to the Bride Wedding Speeches Download Area! Together, this Book and your "Mother of the Bride Wedding Speeches" make a powerful one-two wedding speech writing kit so you can put together a Mother of the Bride wedding speech that is both entertaining and memorable! 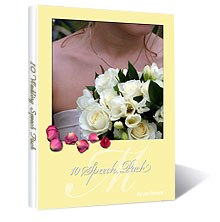 In 24 pages "Mother of the Bride Wedding Speeches Additional 10 Speech Pack" gives you a first-hand look at 10 more professionally written Mother of the Bride speeches, giving you more options at your fingertips. So finally you'll be super-confident about your upcoming speech! And when you claim "Mother of the Bride Wedding Speeches Additional 10 Speech Pack" along with "Mother of the Bride Wedding Speeches" you'll get a significant 51% discount and receive your book for just $19.95 $9.95! I personally guarantee that these will be simply the best Mother of the Bride speeches that you can buy on the internet. If they don't measure up in any way, shape or form then let me know any time within 60 days for a prompt and full refund.